The Televisioling is a television-based lifeform. It resembles a tall, black tower. It consists of an alloy not found in this dimension. On the surface of the tower are monitor screens and a different array of buttons and inserts. Each screen displays an area in its vicinity, but It is very rare for it to show the distorted world of the Externus. Antennae jut out from the top of its body. Out of the Televisioling's surface generates a fleshy figure. Each time it forms a body, it is different every time. It usually takes a form of a four-legged or six-legged creature, muscular in appearance with metallic parts jutting out of it. Its skin is tough like leather and hard to cut. The Televisioling's internal substance consists of wires covered in grey goo. These wires actively move and writhe within the Borderling. Its speech is a trailing electronic noise that gradually changes in pitch. Most of the time, a droning hum resonates from inside its bodies. 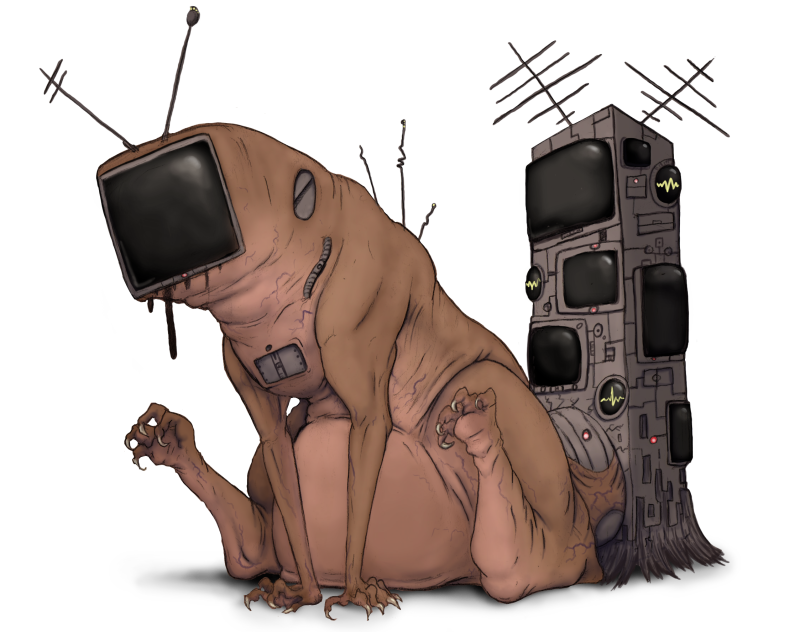 An impure Televisioling generates disfigured and mangled up body parts. The Televisioling appears inside television stations. It travels to and from our dimension as a series of wires. The wires crawl across the floor, finding an ideal place to set up a tower. When it does find a spot to settle, the tower it forms rises from the floor. Locations include behind green screens, recording studios, and in areas less visited by human beings. It rarely generates outside. The Televisioling remains stationary, finding other sentient Borderlings nearby. It produces a signal that only Borderlings would understand. After speaking to the other Borderlings about its message, it gives them a choice to accept or decline. After the Borderling accepts its invitation, the Televisioling will interrupt the TV station's signal. It broadcasts almost anything upon the other Borderling's requests. Strange warning messages, noises, or imagery will appear on air. 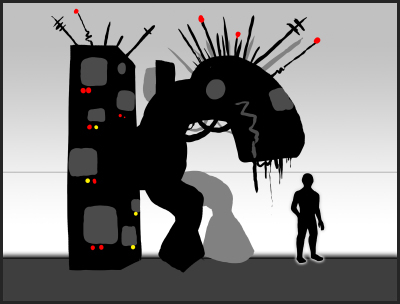 When not taking requests, the Televisioling picks up random noises from non-sentient Borderlings. If a Witness is nearby, it changes its frequencies. To the Witness, the Televisioling had suddenly disappeared. An impure Televisioling doesn't produce signals as well as their healthier counterparts. Sent messages are broken and distorted, making communication with the human world almost impossible. The Televisioling's broadcast interruptions vary from subtle glitches to clear images. The length of its effects on television signals varies from a few seconds to a few minutes. A Witness will see distorted faces and strange noises when their television is turned on. Visual and auditory glitches are the first sign of a Televisioling occurrence. Objects on TV will stutter, melt, speed up or slow down. Bizarre faces will appear on their screens. Growls and whispers will replace silence. Some Witnesses will get inspirations from watching these strange signals on television and create videos varying from Alternative Reality Games, advertisements, and shows. A dirtied red background can be seen. A rounded skull of an unknown animal is on the upper right of the backdrop. The first few seconds Beatles song 'Come Together' was played on a loop. A featureless, grey face is seen, grinning on a yellow backdrop. The faces were on the right while a strange test card is seen on the left. It resembles blocks of asymmetric colors. A news broadcast was suddenly interrupted by a test card. It suddenly became silent after a long period of time. A Witness said they heard scratching from an unknown animal after a minute of dead silence. Shortly afterward, the broadcast returns to normal.